Pass boxes have an important role in sterile area to transfer the material between two different cleanliness levels aseptically. In pharmaceutical manufacturing industries, pass boxes are normally used to transfer a particular material between two areas generally of different cleanliness levels. The boxes can be said to transfer the materials from a high level of cleanliness to a lower level of cleanliness or vice-versa. The pass boxes while transferring the material, help to prevent air from flowing from one area to another. Pass boxes are made of stainless steel which is powder coated. 1. The static pass boxes which are known to transfer materials between two clean environments which are equally clean and are designed to work with minimal personnel movement while dynamic pass boxes are used to pass through materials from an uncontrolled environment to a controlled environment. A static pass box should never be used to transfer material between a clean room and a non-clean room. 2. 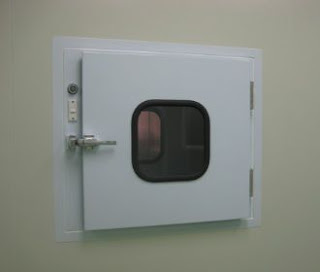 A dynamic pass box is a cubicle box which has got interlocked doors located on both sides. This protects the controlled environment from being polluted while the transfer of a material is taking place inside. A static pass box, on the other hand, has got an electromagnetic interlocking arrangement which is located between the two doors. The arrangement is fitted with an LED indicator which helps to show whether any door is open. 3. A Dynamic Pass Box has got a system known as an Interlock Guard which helps to control both the outlet and the inlet so that there is no time that the two are opened. Due to this, dirt and other loose particles are removed from the materials being transferred to the manufacturing area and vice versa but a Static Pass Box doesn't have such a feature since it only transfers material between two equally clean environments. 4. A Dynamic Pass Box is fitted with a suction filter of around 0.3 microns that is a stainless steel product and a supply filter of about 10 microns that is made of aluminum. A Static Pass Box doesn't have the filters. The Dynamic Pass Box also has a pressure gauge ranging from 0 to 25 mmwc. It is also fitted with a motor blower of 1/5 hp for blowing out dust particles. The Static Pass Box is designed as an air-lock device to prevent ambient air from entering or clean air from disappearing from the clean room. 5. For a Dynamic Pass Box, the Ultraviolet light's specifications are 18 Watts while that of a Static Pass Box is 8 Watts. The Ultraviolet light with hour meter is controlled by the interlocking arrangement and it goes off whenever any of the doors open. The Fluorescent lamp in a Static Pass Box is about 40 Watts while that of a Dynamic Pass Box is about 20 Watts. The lamp is controlled by the interlocking arrangement and when the doors are in a closed position, the lamp is on.